As a full time studio furniture maker my workshop is located on a beautiful parcel of land that is surrounded by trees and wetland. Because of this close proximity to nature it's not uncommon to have wild creatures moving in and around my shop on a regular basis. As Autumn deepens in preparation for Winter I have discovered that there is a span of several days before the first big blast of snow that wild mice seem to intuitively sense the onslaught of cold that is about to come. To shield themselves from the coming weather these mice then begin to migrate into the shelter of warmth, which is invariably found somewhere in my building. The annual arrival of the first mouse is typically announced by a piercing shriek from one of the women in my office, who is startled by an unexpected blur of fur scurrying past her feet. Invariably these shrieks are a call to arms for me to deal with the mouse situation, and as I do every year I break out the "catch and release" traps to snare the unwelcome guests. Before long the traps do their duty, and I am then called upon to take the traps to the edge of the property line where the evicted tenants are turned loose. 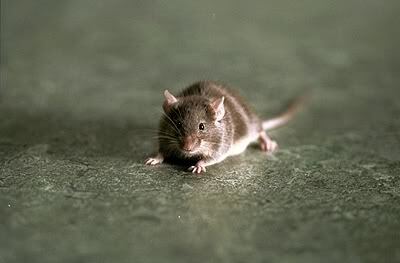 Usually upon release the mice simply bolt for the nearest cover, but every so often there`s one who will brazenly make a mad dash back to the building. More often than not this mouse is back inside before I am, and the game of "catch and release" moves along to round 2. One Autumn a few years back unfolded much the same as it does every year, and as the outside air progressively cooled I wasn't surprised to hear the familiar "EEEK, a mouse!!!!" again one day. And as is my duty I set out to track down the furry culprit yet again. On this particular day I was standing in the middle of the lobby with two of the women, asking them "which way did he go"? Before they could answer all of us fell silent with total amazement, because in that moment the mouse in question walked right out into the centre of the lobby. Walking straight to within 2 feet of where I was standing the mouse stopped and casually sat on his hind haunches and began rubbing his forepaws over his head, as if to clean his ears and whiskers. We could not believe what we were seeing with this mouse being so calm and fearless. What amazed me the most, though, was the transformation in the reactions from both of the women. Moments earlier they were terrified of this tiny creature. But now seeing this same bundle of fur sitting innocently on the floor in front of them they were gushing about how cute he was - all while chiding me not to harm him in any way. But as cute as this mouse was by his actions, it was clear that this was not a normal mouse. My guess is that in one of his mad dashes to flee the kitchen counter he slammed his head on the ceramic floor and, thereby, scrambled a few circuits. 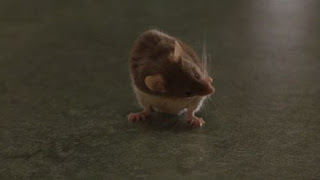 Nevertheless, said wild mouse earned the nickname Mr. Jingles because of how much he behaved like the mouse from the movie "The Green Mile". Over the next few days it became clear that whatever was afflicting this mouse was going from bad to worse. Instead of walking the mouse was now limping, and I was faced with a decision of what to do with him. By now everyone in the shop knew of the mouse, and most were offering their own opinions on what to do with him. The consensus seemed to be to put him outside and let nature run its course. By now a deep blanket of snow was covering the ground, and I could tell from the way this mouse was limping that he wouldn't stand a chance out there. And, so, as ridiculous as it sounds I decided to buy a hamster cage and line it with wood shavings to let the mouse live out his last days in the warmth of my shop. Several times I questioned the rationale on why I was going through all this trouble for a wild creature, but at the end of the day this seemed like the only proper thing to do. The health of the mouse continued to decline, and things finally reached the point where I was feeding him sugar water through a straw as he lay motionless on his side. One night after feeding him I said my good-byes because I was certain he wouldn't see his way through the night. Sure enough when I opened the next morning Mr. Jingles was dead. A few days later I was reading an article that talked about Love, and it said that in distinguishing the difference between love and compassion that love brings with it a desire to relieve pain and bring happiness to another. In that moment I realized that what I had just experienced with Mr. Jingles over the previous few weeks was, on some level, a tangible lesson in Love. Within that context Mr. Jingles had actually been a teacher. We should never underestimate the magic at work in the world.